Photgraph provided by Aerosport, all rights reserved. 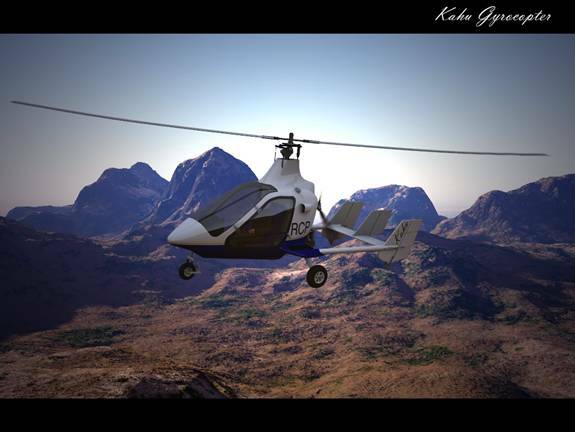 The KAHU gyroplane is an experimental gyroplane that its builders desire to bring to the certified marketplace. The experimental aircraft first flew in 2002 and has been the research platform for the full production model. The manufacturer of the KAHU is Aero-sport and they are making attempts to have this new certified aircraft in production in the near future, providing the funding can be gathered to build the production facilities. The aircraft has been designed and test flown in New Zealand and the builders desire to keep initial production within the country. The very name of the gyroplane, KAHU, is symbolic of its New Zealand birth. The market intentions for the aircraft are to provide the world market with a recreational, light commercial, and military/civic mission role aircraft. The styling of this aircraft has nice, sleek, smooth lines that make as much of an astetic statement as well as its aerodynamic function. In terms of the KAHU’s design, the aircraft is built using carbon fiber material and has been engineered for performance in regards to utility, comfort, reliability, versatility and safety above that offered by most manufacturers in the marketplace of 2008. 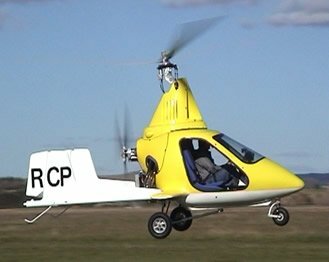 The intent of this newly designed gyroplane is to offer a more economical option to other forms of rotary-winged flight, provide an aircraft with modern styling, can be fueled with gasoline or alternative fuels, provide limited commercial use, and perform in a safe and easy to fly aircraft. The KAHU is a highly streamlined aircraft with an enclosed cabin which is designed for propeller efficiency and protection of the aircraft’s vital systems and components. The gyroplane is a two-seat, side-by side arrangement with a pusher style engine configuration. The aircraft boasts removable doors and access panels for ease in aircraft maintenance. Twin booms are attached to the aft portion of the fuselage and extend back to, currently a twin vertical stabilizer/rudder, on the production version – three vertical stabilizer/rudder arrangement. The tail feathers so designed to help reduce the potential threat of Pilot Induced Oscillation (PIO). Computer-Aided-Design, CAD, has been used extensively in the design to ensure ergonomic factors such as ride comfort, instrument panel layout, control arrangement and visibility are of the highest standard. With these considerations and the use of strong yet light-weight poly-carbon fiber composite the aircraft has a very sound structure for its occupants. The powerplant or engine of the KAHU is a custom designed WADEAero engine. This powerplant will also be available as an item that can be purchased individually from the aircraft for those who desire to use this engine in other aviation experimental projects. The basic engine is a Mazda 13 B rotary engine and is modified for aircraft use and registered under New Zealand Design # 401729. Photograph provided by Aero-Sport, all rights reserved. The prerotator is another design of the team and is an engine driven hydraulic pump that is connected to a hydraulic motor to the rotor for initial rotor spin-up. The PSRU, Propeller Speed Reduction Unit- also an Aero-Sport design, is a component to reduce the engine rpm to a useful level for flight. The PSRU for the KAHU is a gear drive unit and allows for the use of a rather large propeller of 72”. The propeller is a three bladed design. Another thought in ride comfort and pilot fatigue is in the mast design. The KAHU has been designed with a mast support assembly to absorb a majority of the main rotor vibrations that would otherwise find their way into the stick controls. The landing gear arrangement is of a tricycle design with full-suspension (gas) front and main struts. Large 16” terrain tires help ensure safe take-off and landing rolls and has main wheel breaking. 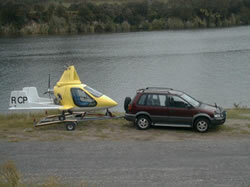 The gyroplane can be trailer towed, with the blades removed, and stored in an average home garage. Many aspects to operator and machine integration have been taken into account with this aircraft and to a level that provides a viable option to helicopter use for civil and national police and defense forces the world over. Photgraph provided by Aero-Sport, all rights reserved. The prototype aircraft has flown for approximately 130 test hours and is nearing final certification. Initial retail price per unit is estimated at $130,000.00 New Zealand Dollars and comes as a complete, certificated aircraft. There are no intentions for any kits of this aircraft at the time of this writing. Bringing this aircraft to production is entirely dependant on Aero-Sport obtaining further investment for its’ production facilities, a goal of which they are hoping to complete in 2009. Initial models to be sold in New Zealand, South Africa and Australian markets, then followed by the United States and United Kingdom. The market plan being to retail the aircraft through a distributor network and they are currently taking inquiries from all sources, prospective buyers, investors, and distributors as well as governmental inquiries. Flight training will also be available for New Zealand operators, through a local –independent ,certified gyroplane instructor.